The face forms an equilateral triangle: the triangle is formed by the brow line over the eyes; and the sides follow down the jaw bone with a rounded finish at the muzzle. Above this triangle the forehead and ears form a rectangle from the brow line to the tops of the ears. The head is small in proportion to the body. Ears are remarkably large and high on the head. They are wide with a deep base. They should be very upright and have rounded tops. The outside base of the ear should start no lower on the head than the height of the eyes, but may be set higher. The inside base of the ears is set close at the top of the head; ideally, a vertical line can be drawn from the inner corner of the eye up to the inner base of the ear. Ear furnishings may be present; pronounced ocelli are desirable. Medium sized and set underneath a slightly hooded brow. The top of the eye resembles a boomerang set at the exact angle so that the corner of the eye slopes down the line of the nose. The bottom half of the eye has an almond shape. The eyes are moderately deep set, low on the forehead, and at least one eye width apart. Tear stain markings are present along and between the eye and the nose. All eye colors are allowed and are independent of coat color. From the frontal view the chin tapers to follow the triangle of the head. In profile, the nose is slightly protruding so that the angle from the nose to the chin slants back, which may cause the chin to appear recessed. The muzzle is tapered with no break. It falls within the bottom portion of the facial triangle that runs from the brow to the point of the chin. Whisker pads are not pronounced. The forehead is a straight to slightly convex curve from the top of the head to the ridge just above the eye where there is a slight change of direction and a straight to very-slight concave curve from that ridge to the tip of the nose. In profile, the face also forms a triangle from the top of the eye to the tip of the nose, turning to follow the jaw line and back up to the eye. Viewing from the front, the nose is wide across the top with low set nostrils. In profile, there is a slight downward turn at the end, giving a rounded appearance. Nose leather is slightly convex and wraps up over the nose. The torso is long, lean and well-muscled with a full deep rib cage, prominent shoulder blades, a slight, but not extreme, tuck-up and a rounded rump. The hip and thigh are full and long and somewhat heavy in proportion to the rest of the body. Longer than average, well-muscled, without appearing heavy or overly delicate. Back legs are slightly longer than the front legs. Medium to thick in width. Medium in length, ending between the hock and just above ground level when standing with preferred length just below the hock. Tail should taper slightly to a blunt end. Whippy tails are not desired. Medium boning with density and strength. Short to medium in length with good substance and a slightly coarse feel to it. Coarser guard hairs cover a softer undercoat; the spots have a notably softer texture than the guard hairs. The coat is not inordinately dense and lies relatively flat against the body. Black, brown (black) spotted tabby, black silver spotted tabby, black smoke. No preference is given to ground color on the brown (black) spotted tabby. Bold, solid markings are preferred on all tabbies. In any variation the lips are black, and the tear duct lines are prominent. On the spotted Savannahs the nose leather can be pink to brick red surrounded by liner, solid black, or black with a pink to brick center stripe. In black Savannahs, the nose leather must be solid black. Paw pads in either color variation should be deep charcoal or brownish black. SPOTTED PATTERN ONLY. The spotted Savannah pattern is made up of bold, solid dark-brown to black spots, which can be round, oval, or elongated. A series of parallel stripes, from the back of the head to just over the shoulder blades, fan out slightly over the back and the spotting pattern follows the line of the stripes from the shoulders continuing the length of the body. Smaller spots will be found on the legs and feet as well as on the face. In the black Savannah ghost spotting may occur. A visible spotting pattern on the smoke Savannah is preferred. In all divisions, any visible pattern must be spotted. 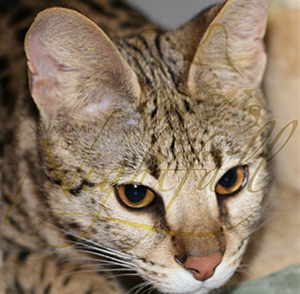 The ideal Savannah is to be a confident, alert, curious and friendly cat. 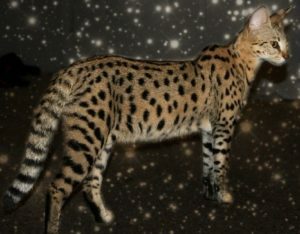 The overall impression of the Savannah is a tall lean graceful cat with striking dark spots and other bold markings, on a background color of any shade of brown, silver, black or black smoke. The Savannah cat is a domestic breed which closely resembles its ancestral source the African Serval, but is smaller in stature. Affectionate and outgoing, with exceptionally long neck, legs, and tall ears, as well as a medium length tail, the Savannah is both unusual and beautiful. 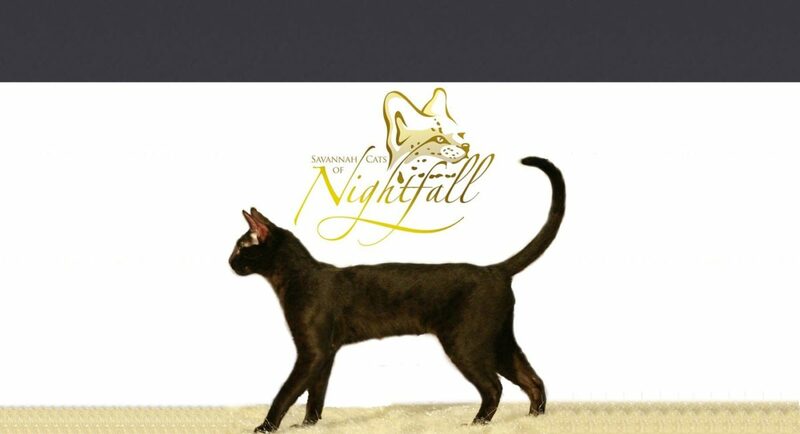 The Savannah is also an exceptionally graceful, well-balanced cat with striking color and pattern. Females proportionately smaller than males. Rosettes. Spots that are any color other than dark brown to black. Any distinct locket on the neck, chest, abdomen or any other area not provided for in the standard. Vertically aligned spots or mackerel tabby type stripes. Cobby body. Small ears. Solid, Tabby and Silver/Smoke Division. Black, Brown (Black) Spotted Tabby, Black Silver Spotted Tabby and Black Smoke.